Coelacanth: model in the SMM paleo lab. Photo by Mark Ryan.Courtesy Fancy Horse (underwater background)The genome of the coelacanth, the world's best known living fossil, has been sequenced by an international team of researchers and is revealing something scientists already suspected: that the primitive-looking fish has evolved more slowly than most other organisms. The coelacanth is related to the lungfish and several extinct Devonian fish species that are considered precursors to land dwelling tetrapods. Kerstin Lindblad-Toh is senior author of the study which appeared recently in the science journal Nature. "We often talk about how species have changed over time, but there are still a few places on Earth where organisms don't have to change, and this is one of them," Lindblad-Toh said. "Coelacanths are likely very specialized to such a specific, non-changing, extreme environment -- it is ideally suited to the deep sea just the way it is." Lindblad-Toh is scientific director of the Broad Institute's vertebrate genome biology group in Cambridge, Massachusetts, which did the genome research. The institute is linked to both MIT and Harvard. The genetic map, which involved sequencing some 3 billion letters of DNA, also showed (via RNA content) that tetrapods - four-legged land dwelling animals - though related to both coelacanths and lungfish, are more closely related to lungfish and followed that line rather than that of the coelacanth. We humans also branched off that same line. The genome of a lungfish is composed of over 100 billion DNA letters, making it a much more difficult task to sequence, so for the time being, the coelacanth's DNA makes for a reasonable alternative for study. "This is just the beginning of many analyses on what the coelacanth can teach us about the emergence of land vertebrates, including humans, and, combined with modern empirical approaches, can lend insights into the mechanisms that have contributed to major evolutionary innovations," said professor Chris Amemiya at the University of Washington, and the paper's co-author. Fossil coelacanth: not much has changed in 350 million years.Courtesy photo by Haplochromis via Wikipedia Creative CommonsWhen Louis Agassiz named the first fossil coelacanth back in 1836, the Swiss paleontologist probably never imagined that a nearly identical descendent of the primitively constructed Devonian-aged fish would one day be found still inhabiting the world's oceans. 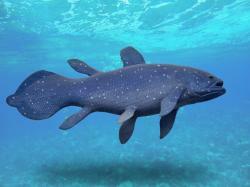 The coelacanth was thought to have gone extinct along with the non-avian dinosaurs at the end of the Cretaceous period. None have been found in the fossil record after that time, but two extant species are known today. The first specimen Latimeria chalumnae was netted off the coast of South Africa in 1938, near the Chalumnae river and retrieved by East London Museum curator Marjorie Courtenay-Latimer who discovered what she called "the most beautiful fish I'd ever seen" in the catch of local fisherman, Henrik Goosen. Since then several more coelacanths have been caught, including the Indonesian species, Latimeria menadoensis, from the Indian Ocean. The remarkable prehistoric throw-back, sometimes referred to as "old four legs" because of its leg-like fins, hasn't changed much in its 350 million year history. A member of the clade of lobe-finned fishes called Sarcopterygii, coelacanths retain primitive characteristics such a notochord, a hollow fluid-filled tube made of cartilage that underlies the spine over the length of its body. In all other vertebrates, the notochord is an anatomical structure that appears briefly only during the embryonic stage but not in adults. Not so with the coelacanth. It also possesses, primitive shark-like intestines, a linear heart, and tightly-woven armor-like scales (known as cosmoid) that are only found on extinct species of fish. The coelacanth's brain case contains only 1.5 percent gray matter - the other 98.5 percent of space is filled with fat. The other end of the coelacanth body begins to taper before expanding into a strange, three-lobed tail. Its most notable features are its lobed pectoral and pelvic fins that are structured with bones that look like toes, and move in an alternating tetrapod manner. An electroreceptive rostal organ located in its snout is used to detect prey, and the coelacanth is the only living animal that can unhinge a section of the its cranium to increase the gape of its mouth, enabling it to consume larger prey. The blue or brown, white-speckled coelacanths prefer deep-water environments, and can reach six and a half feet in length and weigh upwards to 175 pounds. For some reason no living coelacanth has managed to survive more than a single day in captivity. With a dwindling population estimated at only 500-1000 individuals, the coelacanth was declared an endangered species in 1989.